Assembled in 2007 by bass guitarist Mike Skimmerhorn (Chastain, ex-Spike, ex-CJSS), Ohio's own The Mighty Swine, who are now on album number two with "Last Man Standing" (the first album, a self-titled affair, having been released in 2009), are a guitar-driven, hard & heavy/progressive metal band with musical influences ranging from Steve Vai to Megadeth (more on that bit later!). Besides Mike Skimmerhorn (who provides lead vocals in addition to handling bass duties) The Mighty Swine features the services of Stacey Donahue and Jeff Tong (guitarists) and Rory Faciane (drums). Both Stacey Donahue and Rory Faciane are new to the fold since the band's 2009 release and with this new 11-track album following in the footsteps of 2012's (well-received and most-assuredly recommend!) "Lust" single the pair more then proof their worth on this hard hitting release! Recorded at Fat Track Studio in forest Park, Ohio, and with producer Rob Nadler once more at the helms, "Last Man Standing" is a nail-biting excursion into the world of politically-charged heavy metal where the messages are never lost in translation! While the band pulls off a spike-studded, note for note cover of the Judas Priest classic "Hall Bent for Leather" with power and passion on this new album it's actually the group's original material that reaches out and grabs you by the throat! Starting with "All That is Evil" Mike and his comrades arm themselves for an absolute throw-down and even at this album's earliest moments it's clear as day that this fearsome four-piece has no plans for taking prisoners! Musically album-number two ups the ante and if 2009's self-titled release was a tossed hand grenade into the heavy metal scene then "Last Man Standing" is a full on barrage of utter mayhem! Even as their own music carves itself a nice niche in today's scene an observation must be made and this one is by no means a bad thing! From "All That is Evil" on the music of "Last Man Standing" has a distinctive Dave Mustaine vibe going for it! Wait, what? Yes, as personable as Dave's writing is that same kind of refreshing, heartfelt feeling can be found in the lyrically-approach to "Last Man Standing" as well as in it's vocal delivery! And again, this is by no means a bad thing as Megadeth's material has long proven to be amazing from a personal perspective. Granted, The Mighty Swine does carry a bit of a torch for Dave and his crew in other ways as "Last Man Standing" feels (on occasion) as if it could be a cross between Megadeth and Metallica if (and only if!) said bands were more akin to the likes of classic hard rock and heavy metal bands (Ozzy/Black Sabbath, Judas Priest, Rush, Deep Purple, UFO, Armored Saint, etc). Otherwise, as evident by original compositions like "Two Graves", "Empty Shells", "Last Man Standing" and more(! ), The Mighty Swine march to the beat of their own drummer which, in this case at least, is one who never let's things settle down in the least! There's that and then there's new guitarist Stacey Donahue and what he brings to the mix. Said to be influenced by the likes of Randy Rhoads, Yngwie Malmsteen and Eddie Van Halen* his guitar playing most certainly adds an extra dimension to the music at hand with more then a few of these cuts ("Empty Shells", "Tomorrow", "Vengeance is Mine" and the title track again) perfectly crossing over between progressive hard rock and true, traditional heavy metal! And that's pretty much what listeners should expect when it comes to The Mighty Swine's sophomore undertaking. 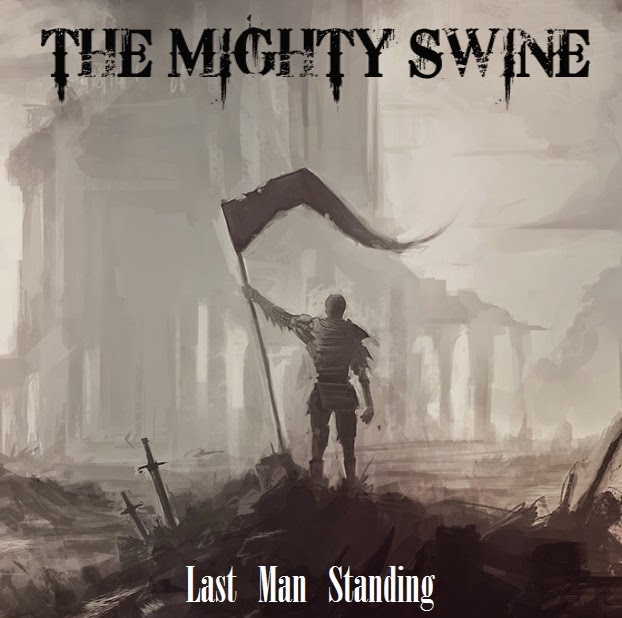 Much darker and decidedly heavier/technical in it's approach, "Last Man Standing" is NOT the same The Mighty Swine as heard on the band's 2009 debut output! "Tomorrow", "Vengeance is Mine" and "Dead Man's Stare" point towards a band that has progressed beyond their hard rock/heavy metal roots and has now fully-embraced HEAVY, guitar-driven and highly rhythmic, METAL that is a far lot closure to the likes of Megadeth and Metallica then the band's debut could have ever imagined! While Chastain might just continue to keep Mike Skimmerhorn busy by day (and no doubt provide a more stable paycheck along the way!) The Mighty Swine (who incidentally have a bit of a older, classic metal vibe about them and could almost be described as "retro" if that wasn't such a puke-inducing word these days!) is a cool vehicle all it's own! And besides, if ever it doesn't work out for Mike with Chastain then you couldn't ask for a better safety net then The Mighty Swine! For this is one band that could easier be more then a side-project!